I’d heard a number of things about this camera before I finally bought it. I heard it was heavy and huge. Some people found it unwieldy, some said it felt more natural in the hand than anything before or since. Some bemoaned the autofocus, some adored it. But overall, it seemed like a good piece of hardware. 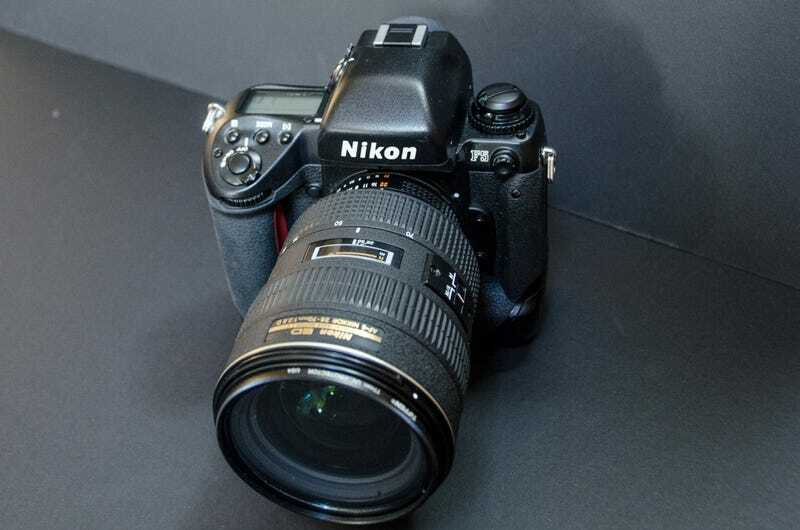 I’m not sure what else I would have expected from Nikon’s flagship film SLR of 12 years, but, well... it is pretty huge. At the end of the day the price was right and one showed up at my door a few hours before I headed up to Quebec City for a big juggling festival. So I dragged it along. First thoughts: it’s big and heavy, yet it almost doesn’t feel that way. The camera is almost three pounds with batteries, and the lens I was using (Nikon 28-70mm f/2.8) weighs another three. That’s six pounds of camera, and yet because of the way it’s shaped if felt glued to to my hand. Switching from portrait grip to landscape grip was effortless, and even though I have miniature hands the controls all fell exactly under my fingertips. The autofocus point selector doesn’t have a very positive click to it, but all the other controls were natural once I figured out that the power switch has a lockout button. Carrying it around for hours on end wasn’t stressful or tiring, though I’m glad I didn’t have a neck strap since I think it would have hung awkwardly. One of the major reasons I bought the F5 over the F100 (aside from durability and weather sealing) was for the focusing. This sounds counter-intuitive, since the F5 only has a five-point AF system. However, it has a very beefy motor driving the focus screw, so it can really haul around the glass inside large screw-drive lenses. The focus speed on the F5 is really something you have to experience. My 80-200 f/2.8 snapped between subjects incredibly fast and tracked movement effortlessly. And with the 28-70 (which is AF-S) the focusing was just hilariously snappy. I actually laughed the first few times I used it. It traverses the entire focus range end-to-end and locks onto a target in about the same time as the viewfinder blackout when you shoot the frame. It’s absurd. But anyway, pictures. These are all shot with the F5 and 28-70 f/2.8,wide open in aperture priority with matrix metering on superia 400 pushed a stop. Let the camera do the work, and see how it does. Quite well. It was dim in the school where the event was, so shutter speeds were a bit... lacking. But not bad. I had the focus set to AF-S on focus priority so it wouldn’t take the shot until it confirmed focus, which is good for people who aren’t moving fast or if you aren’t shooting bursts. In all my shots wandering the floor, the camera never missed unless I totally screwed up. Its mass has advantages in terms of stability. This was 1/4s, I believe. The single biggest problem I had was that the AF points don’t illuminate, and only change thickness when you can see them so it’s a bit difficult to tell which point is active. Fortunately there are only five so it’s easy enough to remember. I also switched the camera to change points as it tracks, which helped. Time then to try things that move a bit faster, so I went over to shoot some volleyclub. It’s like volleyball, but with juggling clubs. It’s pretty intense. I set the focus mode to AF-C, an let it rip in continuous. Again, the camera never missed. Finances depending, I should be shooting ice racing in a few weeks, which will be another good test. But in the mean time, I think I’m in love.